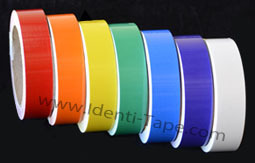 ENGINEER GRADE REFLECTIVE STRIPING TAPE - We carry two brands of Engineering Grade reflective tapes, 3M Scotchlite 5100 Series (see Sell Sheet) and Nikkalite (at page bottom). 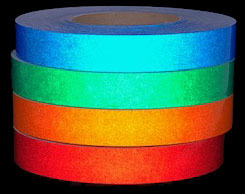 Both these are pliable and conformable reflective tapes that can be applied to many different surfaces. 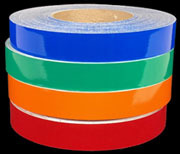 They are ideal for reflective striping on vehicles and for banding fire hydrants to color code them to their flow rates (see rate table to right). Great on bicycles and helmets. Reflective striping makes hydrants, bikes, and helmets visible at night when they would otherwise be difficult to see. They are also great for marking fire tools so they can be found in darkness because they light up before a flashlight. Black reflective tape is popular on motorcyles and with the military.